Free Birds, the movie was released on DVD, Blu-Ray and for download this Monday, 24th March. 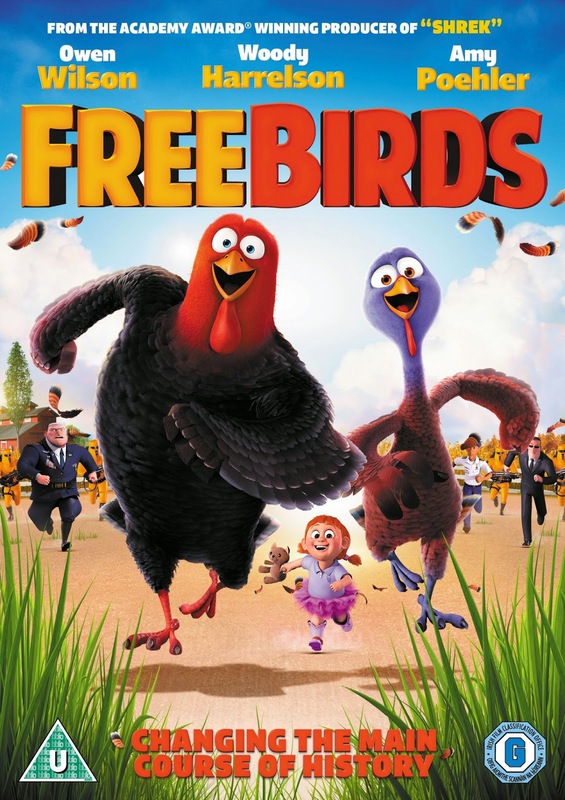 Free Birds stars Owen Wilson, a personal favourite of mine, as the voice of Reggie, a turkey who has an inkling about the farmer's plan for them - they are being fattened up for a reason... almost certainly the thanksgiving celebrations! The other turkies don't like someone rocking the boat and Reggie gets kicked out. In a weird turn of events, Reggie ends up being the traditional US "pardoned turkey" and is given a life of luxury with anything he pleases. While he is chilling out at Camp David he finds out about plans for a time machine and he and his friend (played by Woody Harrelson) attempt to travel back in time to try and change the tradition of eating turkey for Thanksgiving. Lara really enjoyed the movie but I think the context (thanksgiving turkeys) was a bit abstract to her, not k knowing anything about US tradition. I also felt some of the humour was more adult than she would be able to understand, despite it being a U certificate. I felt the movie was a bit weird and I struggled to sit through it all. I felt the first part of the movie was fun but as soon as time travel was introduced I lost the thread a bit and it didn't feel like the same movie.